Quite a few people out today! 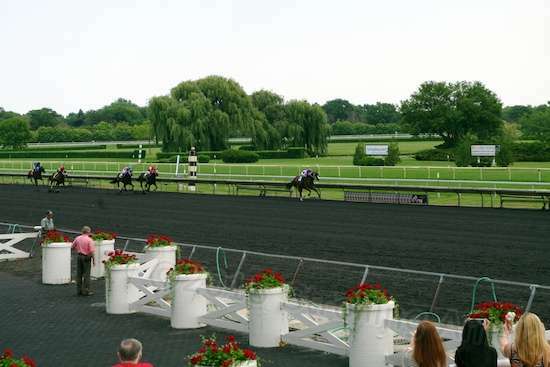 I recently had the chance to put in a weekday afternoon with my son and his family at Arlington International Racecourse, aka Arlington Park. Though I once lived in adjoining Palatine for over two decades, I’d never made it there once. Too much going on. Too much going on these last couple of months too, but that’s just been a stack of to-do’s to get buttoned up before I depart the area in early September. This was my chance to be a tourista for a little while. From my unique vantage point of unfamiliarity and stark ignorance, the impressions that the facility laid on me were like suddenly being immersed in a different culture. Ninety-nine percent of the people here were of course very familiar with every aspect of the thing, knowing exactly how it all works and what to expect next. For me, it was like wandering the streets of the once-kingdom of Siam. Nothing familiar, everything new to me. 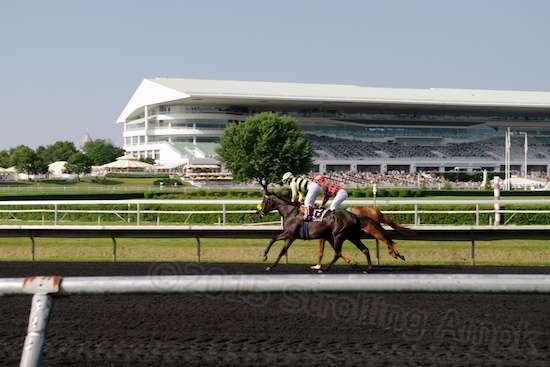 Not particularly helping in this immersive experience was the fact that Arlington has been adamant about its image and the image of horse racing since its construction in 1927. One of six tracks in the Chicago area at one time, it sought to distance itself from the “bookies betting on nags” and “pool hall” stigma portrayed so effectively in movies and TV shows in the 1940s and 1950s. The first track to install a PA system with a race caller. Probably the first photo finish camera setup. The first electric gizmo to total up the aftermath, and be able to display credible results, which allowed shorter prep times between races. Electric starting gate. Huge closed-circuit TV. First million-dollar race. You might have heard of the Arlington Million. The whole thing burned to the ground in 1985. They put up a few acres of bleachers until the rebuild could be finished in 1989. Shut down in 1998 and reopened in 2000. Now, it has merged with Churchill Downs, also within the conglomerate family business of mogul Richard L. Duchossois. Duchossois had owned it with an investor group since ’83. If I recall rightly, there was a bit of a fluff in the 90s when a body was found on the rural Duchossois farm, but despite the media feeding frenzy, it was determined that it had been there a very long time and contained no bullets, so everybody just kind of shrugged and went on about their business. Besides, this is Chicago. People from Las Vegas know what I’m talking about. This is about a third of the building, at most. Posh and expansive. The end effect of this dedication to aura is a vast facility, very carefully designed, styled and shaped. With acres of dense flower beds and uniform, weed-free turf, it is essentially a very carefully-shaped presentation. The working guts are discreetly hidden away behind facades. That’s not necessarily bad, but it does sink in that you are seeing only what the track’s owners and their architects want you to see, and that your experience of horse racing is limited to that. 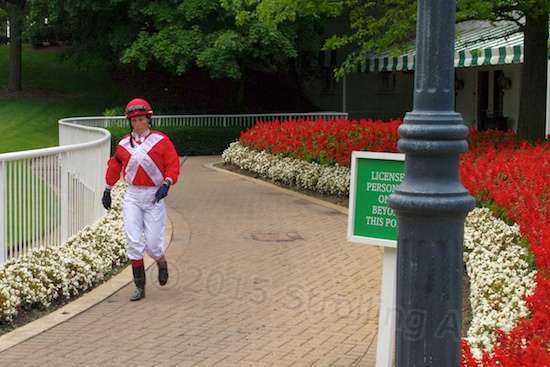 Disneyland’s Main Street USA has nothing on Arlington Park, and Arlington cost me only $4 to get in, as a geezer. Plus, it lacks Disney’s “It’s a Small World” amusement ride, which makes it even more of a bargain. I watched a WWII documentary last night, and once more lamented Adolph Hitler’s managing to kill himself before he could be held accountable. If only we had been able to prevent that, we could have eventually alternated every moment of his remaining years between taking that one ride, and watching the 1950s no-budget drive-in non-thriller “Manos: Hands of Fate.” He would have been stark raving after two full days, once the grinding hopelessness of the situation sunk in. He would have been continually pleading for death for decades, but we’d keep him alive on a steady diet of bread and water, descending to Tang and astronaut food paste in squeeze tubes, once the 60s came about. Oh, the humanity. Opportunity lost. Russkies probably would have reached him first anyway, which, considering what he’d had his SS cleansing squads do in Russia, their payback might have been perhaps as much as a quarter as effective. But they would lack both the ride and the movie, and the mercy of death would have been given to him far too soon. But I digress. Naturally, my spending so much time in the Great Southwest as a snowbird has rubbed off on me too much, and I do not exactly blend in here, appearance-wise. Here, it’s polo shirts, slacks or shorts, and dress shoes, pretty much. My sunhat, wrinkled long-sleeved dress shirt left open over a ragged T-shirt, baggy pants and general slouch lend an air drifting somewhere between Homeless Person and Desert Wretch. That’s okay though. My long sleeves and long pants or jeans make me almost as out of place down there as well. Among many boondocking RVers, it’s T-shirts, shorts and sandals. Most have little reason to control UV exposure, because they drive everywhere, and sit under awnings or inside screened areas. They don’t usually advertise affluence. I suppose I should scale up a little bit up here, but given the muggy conditions, sweating into nice clothing seems counter-intuitive somehow. You wear nice clothing when you won’t ruin it in fifteen minutes. I’m taking it under consideration. Not real seriously, though. 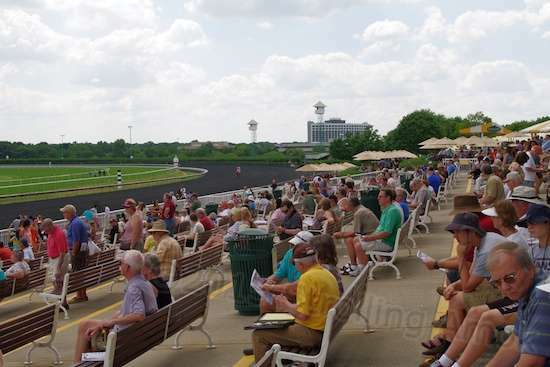 Basically, what the riff-raff like myself do at Arlington is to sit down on a bench outside, in direct sun and the humid mid-80s heat, and watch the horse race. Then find something to do for twenty minutes. Walk around, go in back and see a few of the horses up close, or enjoy the air-conditioned comfort inside to sit, buy food, or place bets. Then head back outside just before the next race begins. The start of each race is kind of subtle here, because all of the day’s races began at the start of the back straight on this one-mile track. That’s not only far away, but pretty much hidden by trees. Once they launch, you can get glimpses of them between the trees, but will depend upon the Jumbotron to see much. Once they’re in the bend, they are in full view, and whoever has money on the race starts yelling and jumping around as discreetly as the surrounding social implications dictate. I found the relative inability to see the entire race kind of an oddity. I’d come to see how the horses run, particularly what kind of start “my” horse makes out of the gate, and how they sort out. Not these folks apparently, even though the order is pretty much already set by the time they do come into view. The main shakeout has already occurred by then, and either people are happy to watch it on TV, or care only about the finish, or both. Not much different than staying at an off-track betting joint, I imagine. That’s one of the things that made it seem like I was in a different country, where different interests and preferences exist. Maybe they conducted a poll and found out that only three out of a hundred care about the first half of the race. There’s plenty of time to go over and check out the upcoming participants. 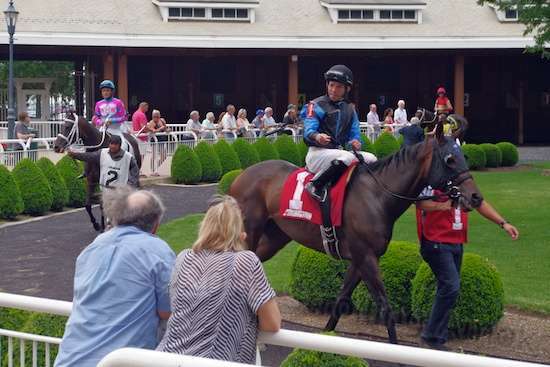 There was one mishap in the early runs, where at the start of the front turf straightaway, one horse bumped another into the inside fence – and through it. Fencing went everywhere and the horse slipped, dumping its rider. Oh, the instantaneous thoughts you have at such moments. Then the ambulance arrives – the one which follows the pack around the track as they go each time – but the horse is back up in an instant and the jockey is, too. My concern that the broken fencing rail would spear the horse are unfounded. It’s white, and whatever it is, it’s not simple PVC piping either, which would be far too rigid. This stuff just shatters and flies out of the way, yet the remaining structure doesn’t seem to wobble or sway from force being transferred down the line. It just goes away where it has to, uprights and all. Apparently, the industry has been working at this potential issue for awhile already. The facilities belie the difficulties of the profession. The race over in moments, the ambulance eventually stops as usual at the track exit and dumps out the jockey, who appears unhurt. Nope, I did not notice how the horse got from the fence to its stall. I was too distracted by instant slow-mo replays of the wreck on the Jumbotron. Its handler may well have come out to check it out and walk it in, but I had noticed a rather impressive “horse ambulance” idling just outside one gate during my walk in. It had the ability to easily pick one up off the ground with multiple slings and ease it inside a work area. Considering the investment in these thoroughbreds, I wouldn’t hazard a guess either way. Hey, bet on me! I’m gonna win! This is as good a time as any to pull out the soapbox, I suppose. This is the first time I’ve ever seen a horse race. From what very little I’ve seen in person, horses come in two varieties: those that like to return to the barn and eat, and those that like to run. Sometimes, you find one that’s difficult to dissuade from running. Those that like to run, often like to run fast. I personally see nothing wrong with horse racing per se. I’ve seen the same thing in draft horses used at pulling contests – they know what they do best, and are often impatient to get going and show their stuff. It can actually be a tough job to hold them back. Hell, I’ve watched two colossally huge Percherons dance excitedly in harness, as if doing that somehow contained their internal boxes of dynamite from exploding. It failed to, this time. All of the teams had seemed to use the drop of the hitch pin into the load as their automatic signal to take off. The drivers’ most difficult job was to keep them back until that act was successfully completed. This is not a timed run, mind you. There is no advantage to hurrying. No hint of urging any of them to go was ever needed. These particular two both thought the pin was down, and bolted like a shot just a moment before their driver could drop the hitch pin all the way into the 8,000 pounds of concrete block skid load. Maybe he had made the mistake of dabbing at it and pulling back if the holes went back out of alignment. Who knows? What I found impressive was that their driver managed to hold onto the reins for the 75 feet or so that it took the horses to realize that this pull was going just waaay too easy. When they stopped to see what the heck was going on, he simply got up off the ground and walked up to lead them back to the side of their trailer, for their next turn later. Didn’t even brush the dirt off the front of his overalls. Like humans, an animal having a real sense of purpose in life can be a considerable thing. What I don’t like about horse racing is that, as usual, the U.S. is lagging back in the wastewaters of a sport because of corruption and turning a blind eye to cheating and bad behavior. Wouldn’t want to get someone in trouble – if they beat the rap, you’ll be a pariah. Don’t make waves, never cooperate, never rat out, never tell what you know. And admittedly, we have a culture which openly romanticizes psychopaths and cold-blooded murderers, reconstructing them into being victims of society, misunderstood adventurous spirits who were good at heart, or perhaps just simple folk who yearned to live free of society’s unfair cage of expectations. Maybe it’s just that, having always been the “can do” people that have led the world in so many areas, we automatically ignore any nation showing more moral spine than we have. The finish of one race. The horses eventually return through this barrel area, and are commonly hosed off to cool them a bit on such a hot day. The winning horse is posed in this area for pictures, with owner(s) and crew. There is a troublesome minority of owners, vets and trainers who will do whatever it takes to get their investment to win the cash, no holds barred. The animal is of value only as a ticket to income and influence, as if you’d handed the horse to a CEO and told him to do whatever it takes to get results that will keep the shareholders happy. The problem is not so much that such people exist. The problem is that their actions are tolerated within the horse racing industry – at least in America. Other participants disapprove, but say nothing for fear of harming the sport’s image. Too late for that – the general perception of it has a vague stink, and always has. Remember PETA, the illustrious organization of extremists credited with blowing up remote backwoods ranger stations, sending death threats to Mayor Daly of Chicago when a cougar was sighted in the city and he ordered it shot if found, and sabotaging the brakes on seafood delivery trucks? The non-crackpot end of the group did manage to get someone behind the scenes at the stable of one high roller who was reputed to bankroll success at any price. It’s good footage, and surprisingly, so indisputable that it led a call for a comprehensive industry rethink by no less than the publisher of Thoroughbred Daily News, for one. It would be nice if such racing participants received sanctions a little stiffer than having their horse scratched from running in one day’s event, when their sins are detected approaching the starting gate. There needs to be a solid chop in income opportunity for that style of participation. Stay within the rules, or don’t bother signing up to race here, because we will err on the side of caution and you’ll be banned for good if caught. Currently, in the U.S. this is not the case, and you may not be watching the fastest horse take the lead. You may instead be watching a drugged-up cripple on its way to being retired and put down on the same day. Once past the finish line, it’s a long trot to ease back down before turning around. So, I do not condemn horse racing as a sport. What I do resent is the same old type of crowd screwing it up for the rest of us. The “outlaws” who game the system, considering the rest of us to be pathetic suckers. And maybe we are, as long as we keep looking the other way. They need to be purged, not wrist-slapped. The entry gate to horse racing needs to be lifted higher not by costs, but by an intolerance toward doping and abuse. Motivate the cheats to progress on to some other sport which is more tolerant of a lack of ethics. Horse racing needs, unfortunately, to become a privilege temporarily bestowed upon strict agreement, rather than a purchased, “catch me if you can” right to compete. How soon will that total rebuild come? Probably not soon. Look at major league baseball. Modern home run artists breaking records, then acknowledging that their exploits were accomplished thanks to steroids and other drugs. It was obvious with a few even at the time. But hey, everybody does it. We can’t help that players in the past didn’t have access to these. Let my record stand. This is progress. And we do let it stand. It would be too embarrassing to take down the plaques that we hyped so heavily. People would lose faith in the integrity of the sport. That of course assumes that they haven’t already, and that not doing anything will help the matter go away. It seems like the surest way to kill anything done for love is to inject a lot of money into it, so it starts attracting another kind of participant entirely. Taken from the far side of the track, these horses ran on the grass and then returned on the dirt at an easy trot. But, did I enjoy the day? You bet. 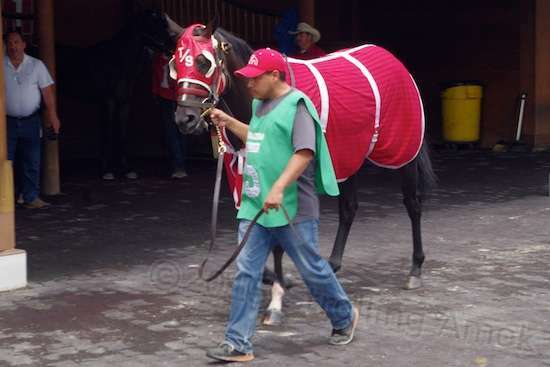 It was a new and very unfamiliar experience, including the backdoor trek I made to get out, which included an impromptu walk over the track’s starting extension on the far backstretch. See, they ran races on both the grass track and the dirt track surrounding it. The dirt is not actually dirt, though. It looks just like dirt, but acts more like a cross between peat moss and a memory foam mattress. It’s synthetic. Plow it or surface it, and it becomes a tall, pliant cushion that your shoe sinks deeply into and compresses. It’s strange stuff. Nary a weed in it, though. Also new but not unfamiliar was the 2-1/2 hours it took to get back to Rockford in the rush hour traffic. Made me thankful for automatic transmissions and radio. In biped terms, it’s a long way back. On a horse, it’s a one or two minute cool down and recovery. Would I go again? Sure, someday: four bucks to get in for the afternoon. Plus, I never did lose that strange feeling of confusion and facade. I wasn’t perceiving exactly what the people around me were perceiving and enjoying, and yet never lost that feeling that I was always in front of the curtain, never in back of it. The back of my mind kept whispering, “Where’s the rest of it? You’re missing something else.” It was tony, upscale, and carefully staged in as efficient a way as possible. It made one want to live the life, but I wasn’t real sure just what that life might be. Affluence? Being a player? Affluence is not something you can fake for long, even to yourself. That shaped presentation, the track’s sheer size and lane width, the vast excess of flowers, the perfection level of everything, the vast outdoor TV screen, the starting gate and backstretch being hidden away – it seemed peculiarly unreal. 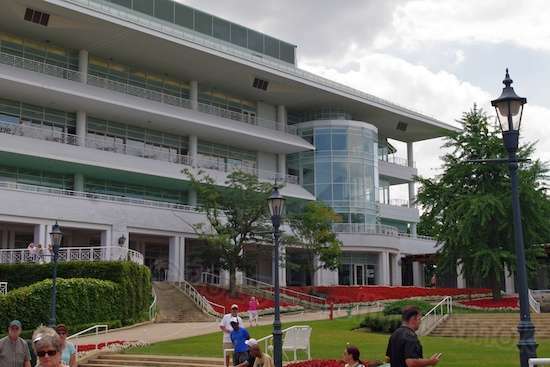 Arlington International is regarded by many to be the nicest such facility on the planet, but does this represent the pinnacle of what horse racing is today? Something was flying right over my head and past me. Since this post should conclude with just what it was that had disoriented me all that time, I’ll say right here what I eventually discovered. Nothing. Don’t have a clue. But next time, I’ll bring my binoculars. 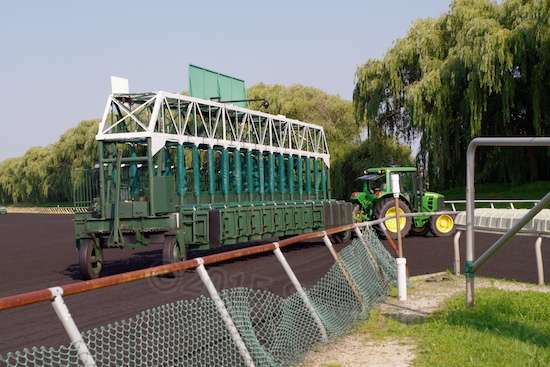 The day’s races over, the starting gate is towed into storage, out of the way. Horse racing is fun if I have $2 riding on a horse with a name that grabbed me, it’s entertainment. 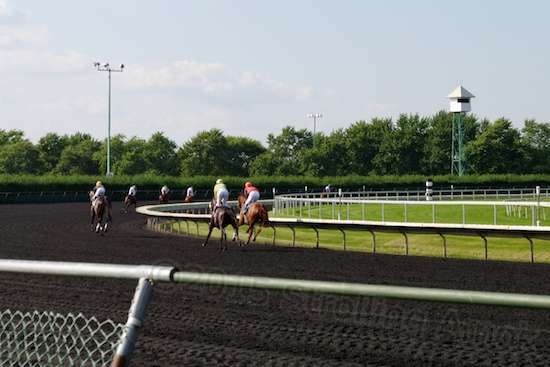 The horse track in Des Moines, IA had a great buffet Thurs night & it was up high enough to watch the whole race. This is my entertainment dollar at work. You said “who will do whatever it takes to get their investment to win the cash, no holds barred”. That Sir IS the modern America! We have a health industry, a Higher education industry, a Justice industry and so many more. All of these have the bottom line as the goal, just like the horse racing & baseball industry do. Just the “products” they deal with are different. Well put, Rob. And may your entertainment dollar continue to yield bounty, too! Good read, as always. Yes, a sense of purpose, a very necessary thing. I struggled with that mightily, although I just wasn’t sure what it was bugging me. After a tumultuous early going out of business retirement I settled into an idealistic life in a beautiful spot. But I just wasn’t satisfied. Fortunately I seem to have satiated my need for purpose with another RV, a motor cycle, and hiking, but it was a tough adjustment. It wasn’t until later that I began to understand just what it was that was bugging me. I have to agree with the first responder, we have become a country where the only thing that matters is the all mighty dollar. Sad to watch it all so I don’t. I’m grateful to have so many reflective readers. Thanks for sharing a bit of yourself, James. On the generalities, to me, our culture as inspired by the media has gradually veered further off into valuing what doesn’t really matter, and the results are so highly concentrated on broadcast TV and most cable that watching it makes it a pretty good depressant for me, so the ol’ roof antenna seldom gets cranked upright. Considering that I used to live for TV, perhaps the constant exposure has simply made me allergic to a newer, HD view of the same old train wreck. Politicians aside, it’s surprising what people will throw in with, do, say or convey for fame or a dollar. That, I admit, hasn’t really changed much, but it has trickled down some. Still, there is good and even brilliance still blooming here and there, like little buds. That’s worth looking for. 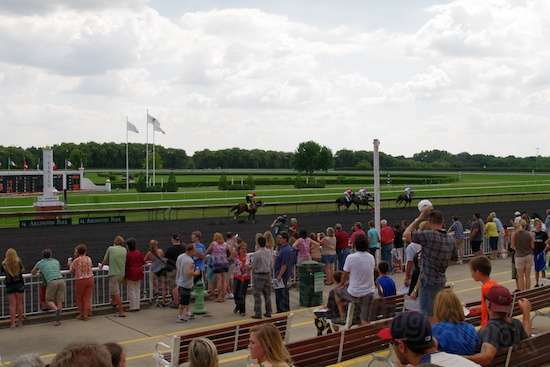 We have Canterbury Downs in the Minneapolis area. We went a few times when it was fairly new but I never did get it. Now they host lots of non-racing events as well. Apparently lots of us didn’t get it. Oh, I’m sure they’re turning a buck. They just want to shake the trees as well. I stayed in Vegas for a wedding years ago. The wedding was fab, of course. Now that I think of it, while I was in a casino, I didn’t get that draw, either. Since I couldn’t even figure out how to operate the electronic slot machines and then how close I came to winning anything, that didn’t help. As Rob said, my “entertainment dollar” was not working for me there, so I went over and watched other people lose their money. Since the shows had long since sold out and I knew how many work minutes it had taken me to carry in every scheckel I had, I grew adverse to the concept of losing it in about the same time it would take to simply flush it down the toilet at the hotel. In the long run, about the same odds of winning. I saved myself the suspense, and enjoyed that feeling. So maybe it was worth going after all.